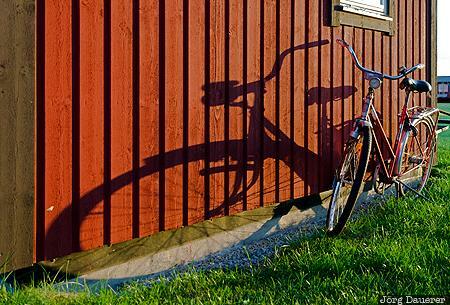 A red bicycle leaning against the red wooden wall of a shack in Gnisvärd back-lit by the evening sun and its long shadow. Gnisvärd is in the south of the island Gotland in the Baltic Sea in the south of Sweden. This photo was taken in the evening of a cloudy day in September of 2014. This photo was taken with a digital camera.